SIPs are a great way to build! In the years following the 1950s prefabricated buildings were very common. Well into the present century, the post-war dwellings that were thrown up “just for now” after the war were something like collectors’ items. Even as late as the seventies, Lewisham Council, in South London, commissioned Swiss-born architect Walter Segal to design a group of houses for land that was too awkward for their usual one-size-fits-all building process. The houses were to be for people from the housing list who were willing to build their own homes, albeit with support and guidance from the borough’s experts. Segal’s idea was simple. The basis was a timber frame based on modular dimensions, making it possible to adapt any building without difficulty. 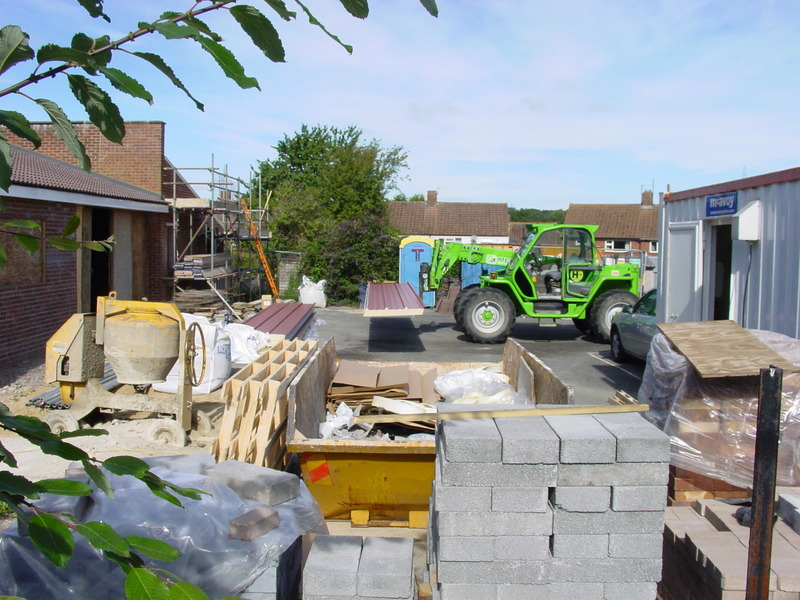 “Wet” trades such as concreting, bricklaying and plastering were unnecessary, as the walls were clad, insulated and lined from dry materials available in standard sizes. They were, in a word, constructed from SIPs: Structural Insulated Panels. Kingspan’s SIPs consist of a layer of insulation sandwiched by plastic-coated aluminium. Again, not very rewarding for metal thieves, but being on a tight budget we simply can’t cater for everyone. Although they won’t look like this when the building is in use because the protective webbing will be gone and a flat ceiling will be above the corridor to the toilets. And I can’t show you how they look from the outside because going up ladders is on the list of things I can’t do. Which is actually quite a relief if I’m being honest. When I’m allowed in, though, I’ll show you how it looks inside the brighter, airier youth room itself with its new sloping ceiling. ← Day 88: The G-men’s next surprise . 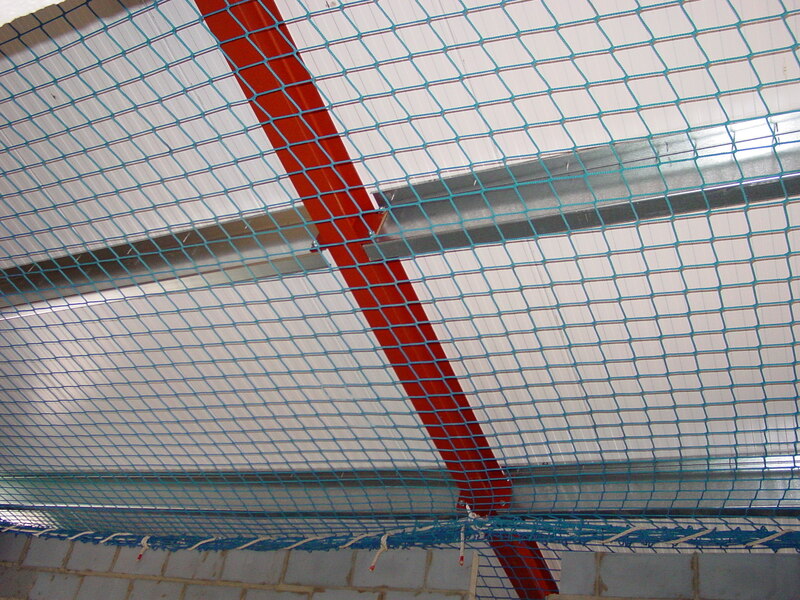 . .
Is the photo below ‘Structural Insulated Panels’ showing up on yours – it isn’t on mine, tough there is space for it. Nope – I’ve looked and looked. Should it be “Is”? as in “Structural Insulated Panels is a great way to build”? And sorry about the photo. I tried to lift it from a project I did on building the eco-cabin in my garden, but maybe it would be infringing copyright or something. Plus the fact that something has gone seriously wrong with my computer . . . I didn’t look very hard, did I? Now, alas, I can’t do today’s post owing to computer problems. And camera problems. I have avidly followed the progress of the building, albeit from a distance (California), but I’m so excited to be coming this week to see the site in person. Although, I must say, that the blog with photos is almost as good as being there. I too am missing the first photo (love the title, though!). Sorry about the photo, Jeannine (see reply to Jenny above). When you next visit I might sit you down with my Ecobuild project and make you read it cover to cover. And then test you on it!